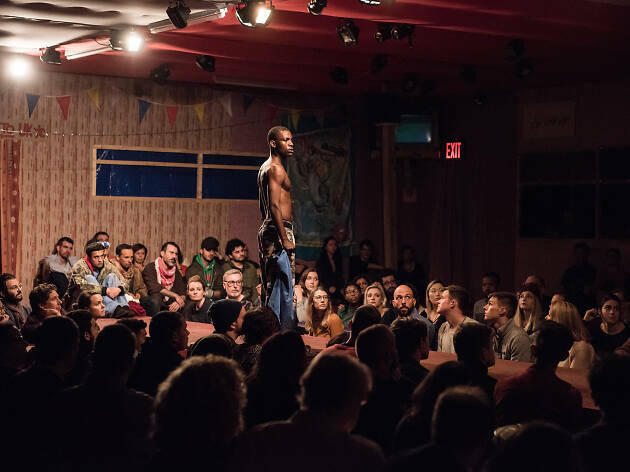 For seven months in 2015 and 2016, the British duo Joe Murphy and Joe Robertson ran a theater in Calais, France, in the makeshift settlement that many called the Jungle. Thousands of refugees waited there to cross the Channel into England, and volunteers like the Joes had shown up to help. They called their performance structure—a pack-and-play geodesic dome—the Good Chance Theatre, because immigrants thought, each night, that they had a “good chance” to get to Dover. The camp was bulldozed in 2016, along with all its chances, but people are still there, sleeping under tarps and bridges. Murphy and Robertson’s The Jungle is based on their time in Calais. If you’re looking for effortless exposition or delicate characterization, this nearly three-hour immersive play won’t afford it. It’s not artful as a piece of drama; rather, it’s a deliberate cacophony of voices. Co-directors Stephen Daldry and Justin Martin insist on roars of disapproval and protest at every turn: A chorus of shouts goes up after almost every declarative statement, and every entrance is taken running. The play wants you to feel, for a moment, what it’s like to live each moment at a crisis point. The Joes write from what they know, so white British volunteers—particularly the idealistic Beth (Rachel Redford) and the overwhelmed Sam (Alex Lawther)—stand at the center of the work, with Sudanese, Afghan and Iraqi immigrants explaining their stories to them. Here are the seemingly insuperable problems the immigrants and volunteers try to solve together: how to administrate, how to keep inter-refugee disagreement to a minimum, whether to bargain with French officials, when to bend, when to break. Safi (Ammar Haj Ahmad), our narrator, tells us that stories start at the end, so we know from the start that evictions are coming and which of the high-spirited boys will die. There are a few women, like the Eritrean Helene (Nahel Tzegai), but most of the 18 cast members are men. 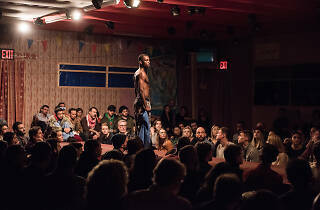 They swagger, scream, dance and generally rattle the walls of Miriam Buether’s set, a giant wood-and-plastic tent where the audience sits at gigantic tables. We are “in” the Afghan Café, run by Salar (Ben Turner), who has seen his home village destroyed twice and vows he will not be pushed out again. The play focuses on stories like his, which provide the actors with big, bravura speeches of defiance or pain. The most moving of these belongs to Okot (a deft John Pfumojena), who says that every refugee “dies many times” before telling his own nightmarish story of escaping Sudan. The piece is impressive, and it has moments of virtuosity, especially in the music. (The musical director is Sunny Jain.) And it’s good when theater uses its tools to place us into among people whose suffering often goes ignored. But theatrical methods can also backfire. The show is produced so well that it’s turned into a “good show,” which brings with it a kind of transactional stain. At the intermission, for instance, we go into the lobby to mill around the dome—the actual one that Good Chance erected in Calais—where we can buy drinks. The effect is a bit like a gravely serious theme park. (On the night I went, a gentleman in a cashmere sweater was looking around for a place to put his glass, and he shrugged at the inconvenience. “I guess that gives you more of the immigrant experience,” he mused.) Whenever anyone is brave enough to make a piece about poverty, there’s always a risk of this kind of disconnect: The more immersive the production, the more it feels like we’ve bought a ride on The Immigrant Experience. I applaud St. Ann’s for bringing the show to New York; I applaud the creators for devising it. But when the gorgeously openhearted gesture of making theater for refugees turns into a show for the wealthy about refugees, part of its moral beauty slips away. St. Ann’s Warehouse (Off Broadway). By Joe Murphy and Joe Robertson. Directed by Stephen Daldry and Justin Martin. With ensemble cast. Running time: 2hrs 45mins. One intermission.